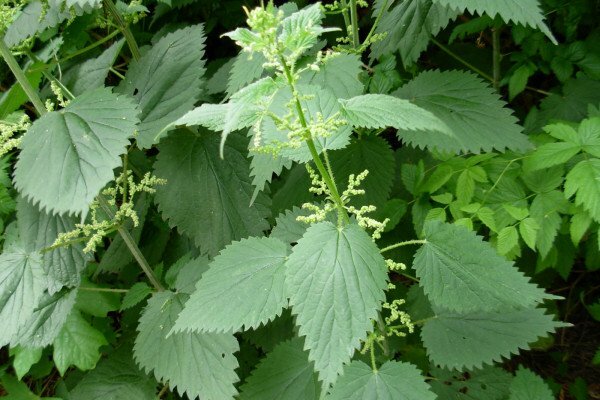 This week we are looking at nature's arsenal, and we thought that probably the part of nature's arsenal you're most likely to come into contact with will be stinging nettles. So Ben Valsler went to Cambridge University's Department of Plant Sciences to talk to Dr Beverley Glover about exactly what they are. So Beverley, why is it that nettles sting? Beverley - Well they sting you in order to try to protect themselves. It's a mechanism to stop being eaten by rabbits, by cows, by things that would normally damage a plant out there in the wild. Ben - What advantage does stinging offer over say just tasting bitter? Beverley - There are all sorts of different ways plants defend themselves, some taste bitter some make poisonous chemicals, some make cyanide even. And some go about it by having a combination of physical defense, say a sharp hair and a chemical component in it. So they really do put things off and they're very successful as a result. Ben - So the way a nettle stings is by effectively stabbing you with a really sharp hair and then injecting a bunch of poisons in. What sort of chemicals are they're using?. Beverley - Well its not a straight stabbing mechanism. The hair is very brittle its got silica in the cell wall. What actually happens is that when you brush against the nettle you break the hair, leaving a sharp edge to the silica wall which scratches you and then the chemicals flow up the hair and into the scratch. It doesn't stab you so much as scratch you. The chemicals it's using are an interesting question, people used to think it was formic acid because the sting feels like the sting you get from an ant or bee and that's formic acid but it turns out it's not. It's a mix of acetylcholine, serotonin and histamine. So it's basically the neurotoxins in there that are hitting a nerve and making it sting. Ben - So you mention that it's good to defend them from cows and that sort of thing. Are all animals effected equally? Beverley - I'm not aware of anybody having tested a whole batch of animals but there is some interesting data out there that says that rats aren't that effected by them. They tested some of the chemicals from the nettle sting on cell cultures and while human cell cultures respond by producing various chemicals in response, rat cell cultures were apparently not affected at all. So it seems rats are immune. But certainly if you watch rabbits they'll graze around them and cows will as well. Ben - So they sting in order to defend themselves, to stop themselves being eaten, but is there actually anything in them worth eating? Beverley - Yes, very much so. Well all plants are full of sugar because they photosynthesize, but nettles grow in places that have got a lot of phosphate in the soil so thats why they grow round farms and around human habitation. They grow on run-off from agriculture. Phosphates are expensive for plants to acquire, the fact that nettles have got a lot of it in them makes them interesting for most animals to eat. But apparently they are also quite high in Vitamin C and Vitamin A which is why people eat them sometimes. You can make nettle tea and nettle soup and they were apparently used a lot in the Irish potato famine as a standby food source when things got really bad. Ben - Is there any way to avoid being stung? Beverley - Well there's lots of different ways. The theory goes that because the hair breaks as you brush against it, then if you actually grab it and press it quite firmly then you'll bend it over and it won't break, won't be able to scratch you and you won't get stung. Another way is to choose your nettle carefully so theres a lot of evidence to say that the frequency of the stinging hairs increases in fields where theres a lot of grazing. If you're looking at a nettle in a field full of cows chances are its pretty spiky but if you go somewhere there aren't many cows or rabbits around the nettles will be less stingy, and so you might actually find it's easier to grab them. In my experience, if you go down to to the base of the stem and actually grab the nettle down near the roots as close to the soil as possible there are very few hairs usually down there as well. Once you've got your nettle the way then to stop it stinging you is to heat it in some way because heat denatures the chemicals in the sting. Ben - Fantastic. If you have been stung and its itching and stinging is there anything you can do to stop it? Beverley - Because one of the chemicals is a histamine then applying/taking an antihistamine will stop the sting happening fairly quickly, but usually it only stings for about 20 minutes so anything to take your mind of it, a nice ice cream or something, will probably do the trick. Ben - Beverley Glover, thank you very much. Beverley - It's been a pleasure. Thank you. Ben - Now, armed with Beverley's advice I'm going to try and make myself a cup of nettle tea without getting stung. I have come somewhere where there's no grazing and that's my own garden. I don't keep rabbits or anything like that. I need to find a nettle and grab it from near the root, just down near the soil there and grab it really hard and pull.....this is a success. I have myself a nettle, I'm going to take it inside and see if I can make some nettle tea. Ok, I'm on my way into my kitchen now, so the first thing I need to do is to rinse these nettles off. So now that I've got my nettles all rinsed, the next thing I need to do is to cut the leaves off, I don't really want to use the stem in my cup of nettle tea. Now while the kettle's boiling, I'd just like to say if you do want to do this at home feel free to try it out, but if you want to you can wear rubber gloves, they will keep you safe from the nettle stings but I thought I'd just give this a go with no protection whatsoever. The kettle's boiled now so lets pour my tea.....already that smells very plant-like, like a herbal tea. I'm going to leave it to brew for a bit and come back to you later when I'm ready to drink it. Ooh, well it tastes quite good really. A bit like green tea, its got that fresh leafy flavour but its a bit more bitter and I've actually heard that if you add lemon to nettle tea it will change colour, a bit like a pH indicator, but I think I will save that for a different kitchen science. 1. Try and find your nettles in a place where there's little grazing so the nettles have developed fewer stings. 2. Grab the nettles firmly so you just push the spikes away instead of breaking them into your skin. 3. Try and grab them at the base where there should be fewer spikes. 4. Heat them up. It's the heating stage that's really important as it denatures some of the proteins in the poison, it denatures the proteins that makes those spikes so it stops the nettles from being able to inject that into you. Next Why has the summer been so wet? Are plants sensitive to sound?